Will international adoption be replaced by surrogacy? La gestation pour autrui va-t-elle remplacer l’adoption internationale? Until the 1960s and 1970s, infecund (sterile) Western couples who desired a child but could not have one of their own could usually adopt a child in their home country. However, as contraception developed and induced abortion became legal in the West, fewer and fewer children were unwanted and abandoned by their birth parents and the number of domestic adoptable children progressively declined. In France for instance, the total number of legally adoptable children (‘wards of the state’) fell from 100,000 in 1950 to 46,000 in 1970, 5,000 in 1990 and less than 2,500 today (Verdier 1986; ONED 2016). This is why, when assisted reproductive technologies were unsuccessful, some infecund Western couples adopted children from abroad. 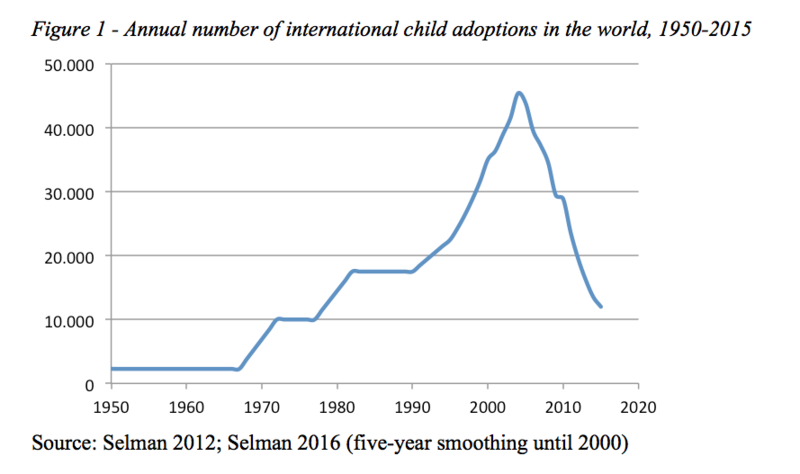 From the mid 1970s to the mid 2000s, the number of international child adoptions rose from close to 10,000 to more than 40,000 per year (Figure 1; Selman 2012; Selman 2016). Close to half of international adoptions were to the U.S. and the other half to other Western countries such as France, Sweden, Italy and Spain. In contrast, the United Kingdom adopted few children from abroad, partly because since the 1980s relatively high numbers of neglected or abused children have been taken away from their parents and placed for adoption (Mignot 2016). Initially, many of these internationally adopted children came from Asia and especially South Korea. Since the 1980s, however, the countries of origin of these children have become more diverse, not only in Asia (China, Vietnam, Cambodia) but also in South and Central America (Colombia, Brazil, Guatemala, Haiti), Eastern Europe (Romania, Ukraine, Russia) and Africa (Ethiopia). In the mid-2000s there were more than 40,000 international child adoptions every year (Figure 1). Since the mid 2000s, however, the annual number of international adoptions has plummeted for various reasons (Mignot 2015). The drop in mortality worldwide has reduced the number of orphans. The number of children who are abandoned in the countries of origin has also decreased in response to the decline in fertility, the lifting of the stigma of illegitimacy and the implementation of social and child support policies. In addition, more of the orphans and abandoned children in the origin countries are now adopted domestically by members of the rising middle class. Finally, the 1993 Hague adoption convention has been signed by an increasing number of countries (currently 98 contracting states); this has strengthened the international regulations on child adoption and further reduced the number of adoptable children (Hague Adoption Convention 2016). Today many, if not most, inter-country adoptees to the U.S. and Western Europe have ‘special needs’, which means they are more than 5 years old, have disabilities or must be adopted together with at least one sibling. The worldwide decline in the number of adoptable children, and especially of healthy newborns, may increase demand for substitutes to child adoption, primarily surrogacy. In the most common type of surrogacy today, called ‘gestational’ surrogacy, the surrogate mother undergoes in vitro fertilization and carries a fetus which is not genetically related to her. Following the birth of the child, she relinquishes parental rights to the intended parents, who are most often – but not necessarily – the child’s genetic parents. Most current gestational surrogacies are also commercial, i.e., the intended parents pay to have the surrogate mother bear their child. In Western countries where couples adopted many children from abroad and where commercial surrogacy is legal, e.g., certain U.S. states including California, some data seem to indicate that surrogate births are becoming more frequent over time (Armour et al. 2012). Some couples may actually prefer to have a child through surrogacy than to adopt one, if only because surrogacy enables them to have a child that is genetically related to at least one of them. In the Western countries where couples adopted many children from abroad and where commercial surrogacy is illegal, e.g. France, Sweden, Norway, Italy, Spain, Switzerland and Canada, one may expect more couples to opt for international commercial surrogacy. This practice is legal in countries such as Ukraine, Russia and certain parts of Mexico. It was legal in Thailand until 2015 and in India until 2016. In the latter country, approximately half of the 25,000 children born from surrogacy in 2012 were for foreign parents (Rozée et al. 2016). Indeed, in the year 2012 there were approximately 20,000 children born through international commercial surrogacy in the world, against 19,439 international adoptions (Scherman et al. 2016). 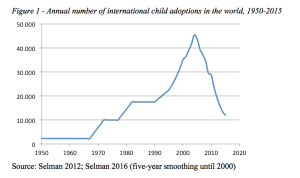 Since then, the number of international adoptions has declined (12,000 in 2015), while the number of international commercial surrogacies has likely increased. The predictable rise in Western demand for commercial surrogacy will likely provoke political debate both in the West and in less developed countries, starting in those where the practice is, or has been, legal. As it turns out, even in contexts like India, where surrogacy was socially stigmatized, most surrogate mothers considered it positively, as a well-paid job that enabled them to improve their own and their children’s life prospects (Rozée et al. 2016). In addition, in contrast to internationally adopted children, those born through surrogacy do not feel abandoned by their surrogate mother, and are therefore less likely to suffer from low self-esteem. If commercial surrogacy is to be made legal, however, should it not be regulated to protect all parties involved and especially to guarantee that the intended mother and father are capable of being good parents, as is the case with international adoption? Should intended parents tell their child how he or she was conceived and, if so, when and how? Thailand decided to ban commercial surrogacy for both nationals and foreigners in 2015 and India did the same in 2016. In both cases there was the fear that poor women could not really ‘choose’ to become surrogate mothers – and also a feeling that international surrogacy was something of a national shame. Thailand and India did not want to be seen as lending women’s wombs to foreigners. Similarly, in the 1970s, South Korea was accused by North Korea of selling its children to foreign countries, and following the 1988 Seoul Olympic Games it was accused by Western countries of being a rich country that neglected its children (Hübinette 2004). This is why, since the 1980s, South Korea has made an effort to reduce the number of its international adoptions. As international commercial surrogacy moves to new countries such as Cambodia and Kenya, it may be time to establish international legal regulations to make sure that surrogacy is in the children’s interest – just like The Hague convention made sure that international adoptions did not trigger child trafficking. ARMOUR Kim L. (2012) An Overview of Surrogacy Around the World. Trends, Questions and Ethical Issues. Nursing for Women’s Health, 16(3), p. 231-236. HAGUE ADOPTION CONVENTION. (2016) Status Table. HÜBINETTE Tobias (2004) Korean adoption history. Community 2004. Guide to Korea for overseas adopted Koreans / éd. par Elena KIM. Overseas Koreans Foundation. MIGNOT Jean-François (2015) Why is intercountry adoption declining worldwide? Population and Societies, 519. MIGNOT Jean-François (2016) L’adoption plénière en France et en Angleterre-Galles : une histoire comparée du droit et des pratiques (1926-2014), Droit et société, 93, p. 417-435. ONED – OBSERVATOIRE NATIONAL DE L’ENFANCE EN DANGER (2016) La situation des pupilles de l’État au 31 décembre. ROZÉE Virginie, UNISA Sayeed, DE LA ROCHEBROCHARD Elise (2016) Surrogacy in India. Population and Societies, 537. SCHERMAN Rhoda, MISCA Gabriela, ROTABI Karen Smith, SELMAN Peter (2016) Global commercial surrogacy and international adoption: A brief comparison of similarities and differences. Adoption & Fostering, 2016, 40, p. 20-35. SELMAN Peter (2012) Global Trends in Intercountry Adoption: 2001-2010. Adoption Advocate, 44, p. 1-17. SELMAN Peter (2016) Global Statistics for Intercountry Adoption: Receiving States and States of origin 2004-2015. VERDIER Pierre (1986) L’enfant en miettes. Toulouse : Édouard Privat.